Perhaps, there is no such person to whom this picture would not be known. 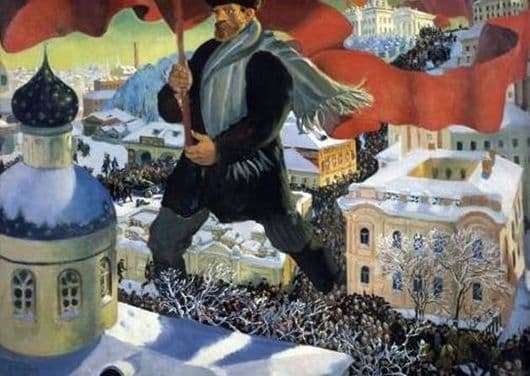 The picture was painted under the impression of the October Revolution. The motive for writing the picture was the desire of the artist to convey to the viewer the image of the hero of the time – the Bolshevik. In this picture, the character was first written by the artist in a manner that was completely atypical for him. Earlier, Kustodiyev never depicted unrealistic characters. In this case, however, there is a grotesque increase in the role of the Bolshevik figure. A huge man in a hat with a hat and a padded jacket walks along the streets of the capital with a huge waving flag of the country of the Soviets in his hands. The flag is huge, it is a symbol of the fire of the revolution. And everywhere people, people, people… They are armed, they are determined to fight for their interests. no less determination filled the face of a giant. He is a simple Russian, an ordinary worker. He is the same as everyone who took to the streets. He walks confidently, clearly understanding where his path leads. Before him there is only one obstacle – the church. It symbolizes the imperial power, its last stronghold. But the giant will not stop and she – he will take a decisive step and cross the church with ease. The movement of revolutionaries is striking in its mass character and strength. The giant personifies, as it were, the leader of the crowd – he points people to the right path, leads them to a new life. The Bolshevik shows them that there are no more obstacles and fear, the Soviet people are only waiting for a bright future. The picture is full of illusory ideas about the very meaning of the revolution and its significance for the people. This is due primarily to the misunderstanding of these problems by the author of the picture. Kustodiev was very grateful to the Bolsheviks for their help in his work and appreciation of his talent. His gratitude largely formed the basis of this canvas.